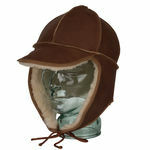 Luxurious sheepskin hats particularly excel in windy conditions keeping the wind chill at bay. Our best selling Natasha Hat featuring lambskin inside the crown area for supreme warmth in winter. Our Lara Hat with generous long wool sheepskin band looks great with our lambskin gloves in Black. Both ladies sheepskin hats and the fabulously warm unisex Trapper sheepskin hat are handcrafted in New Zealand from finest quality NZ lambskin. To complement your winter hat don't miss our sheepskin mittens & gloves for keeping your hands warm too! Plus see feedback from delighted customers of both our hats and gloves. SALE NOW ON - ALL sheepskin hats reduced! Our warmest winter sheepskin hat yet, particularly popular in the coldest parts of Canada and USA. Features premium grade sheepskin throughout with its leather side having undergone a wax treatment to help repel water. Our best selling women's sheepskin hat - hand-made in New Zealand from beta lambskins that are soft, lightweight and warm. Note the Sand color is being discontinued so limited sizes remain available in this color - see dropdown selections. A luxurious genuine sheep skin boa wrap (like a sheepskin scarf) made from twisted natural long wool lambskin.